Arizona Geology: Arizona mining scams "alive and in good standing"
Fraudulent mining schemes are "alive and in good standing" according to an article, "Recent Arizona Mining Scams," by W. Scott Donaldson, in the May issue of Arizona Attorney magazine. Donaldson notes scams dating back to the 1800s but focuses his analyses mostly on modern events. 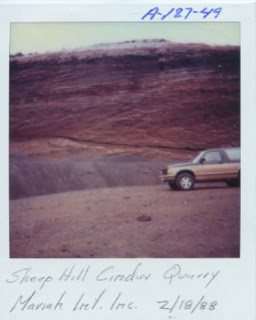 He examines a number of case histories ranging from the Desert Gold Mining Co's salting of samples in their supposed Phoenix gold mine with gold dust, to Xenolix Technologies claims to be able to recover gold from volcanic cinders from the Sheep Hill property near Flagstaff [right, photo credit AZ Corporation Commission], to International Precious Metals Corp, which he calls the "mother of all recent Arizona desert dirt plays," with their claims of sensational platinum and gold grades in rocks 90 miles west of Phoenix. The Arizona Dept. of Mines & Mineral Resources, which was merged into AZGS in 2011, carried out its own investigations in the 1990s and could not find any platinum or gold in hundreds of samples and only traces of silver. ADMMR published a report in 2002 on Arizona mining scams and unassayable ore projects. It covers many of the case histories in Donaldson's article. The article continues its tour with Peter Pocklington, former Edmonton Oilers owner, and the Golden Nugget Mine near Quartzite. Pocklington and his associates were ordered to pay over $5 million in restitution to investors and he was sentenced to prison, house arrest, and probation time for securities fraud, perjury, and failure to disclose millions of dollars of income as a gold mine consultant in the affair. Donaldson concludes the article noting that the pool of potential investors in these fraudulent activities seems to renew itself in less than a decade. Our own experience is that we seem some of these purported gold and platinum mines repackaged with new names and promotional materials within a few years. Donaldson warns that he expects to see the Sheep Hill property "be proposed as a source of gold or platinum in cinders in the not-so-distant future." On a related note, the State of Arizona has just eliminated licensing of assayers. One argument in favor of the legislation is that it limited competition from assayers who were not licensed to practice. Phony or questionable assays have always been one of the key tools used in mining fraud, so please, buyer beware. Assayers are no longer required to be registered or licensed in AZ; geologists licensure is now "voluntary" so buyer beware....but no way to have assurances anymore. Ask your legislators and the governor how the public is protected. I guarantee that my assays will find gold in your samples!! Bring it on!! Ducey's actions re the de-licensing of geo-professionals, including assayers, is shortsighted and reflect the general disregard, bordering on contempt, for practical earth sciences in the U.S. This attitude is compounded by the recent defenestration of the Arizona Geological Survey.